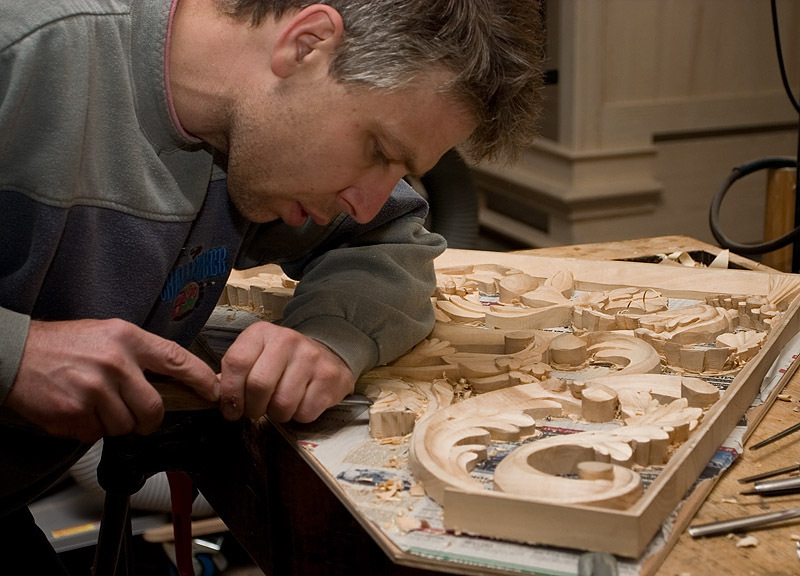 Our cases are built by cabinet maker and ornamentalist Freddy Risser, alongside with heritage furniture restorer Mathieu Lichty, alumnus of the applied art and crafts school ateliers Walser. 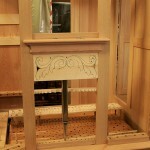 The combination of their skills enables a flawless technical realization, coupled with an expert sense of styles. 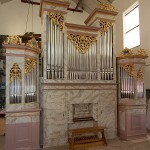 It allows a harmonious integration of the organ in the hosting monument. 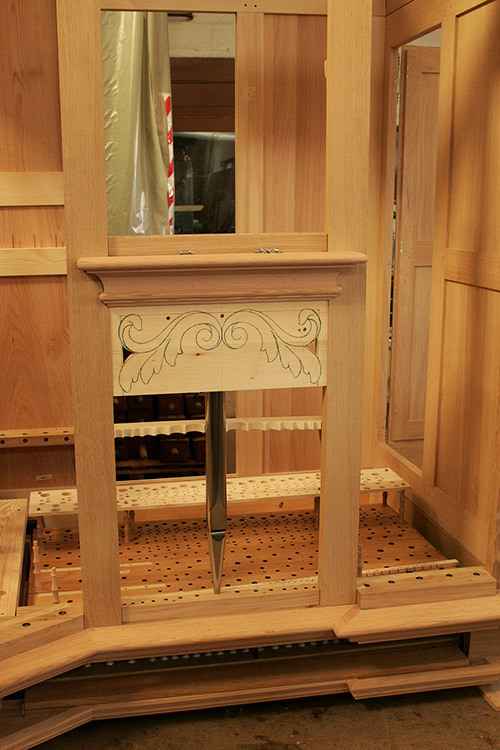 Structure of cases is assembled according to the traditional techniques of joinery with pegged mortises and tenons. 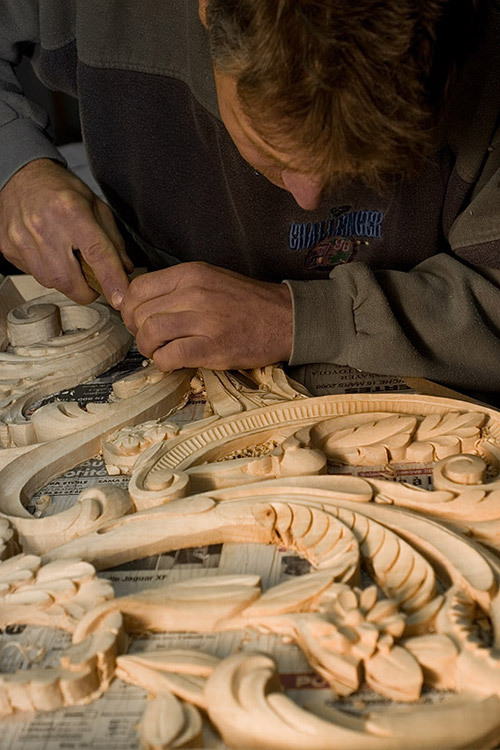 Sculpted ornamentation of cases and consoles is also achieved by Freddy Risser. 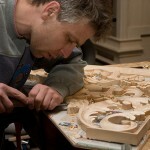 Some pieces are occasionally outsourced to our partner Philippe Remy, cabinet maker based in La Bresse. 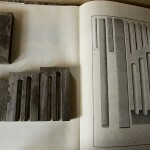 They are both alumni of the cabinet maker graduate school of Avignon. 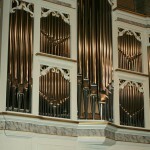 When designing a new organ, they create ornaments suited to the overall style of the instrument. 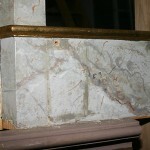 They can as well reshape the missing parts of a case to restore. 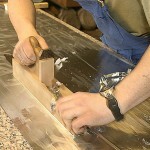 The band saw is only used during the rough turning phase. 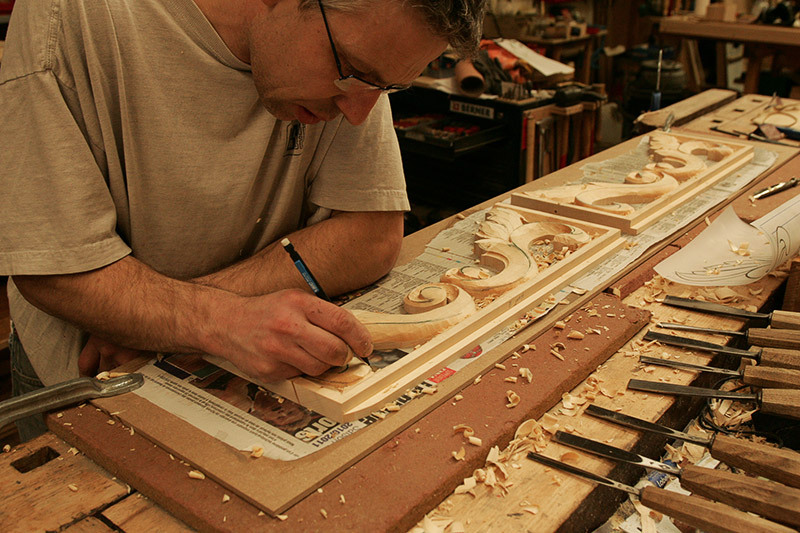 The following work is entirely done by hand, using a variety of chisels and mallets. An acute sense of proportion and volume, as well as a good knowledge of the wood structure are required. 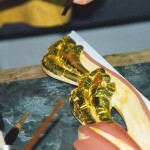 There are seventeen principal steps in order to achieve a tempera gilt work; that is to say, glue, bleach, seal and dogfish trim, soften and sand, hone, degrease, whet, yellow, smooth, plate, rub, gild, burnish, matte, mend, silver-gild and coat. 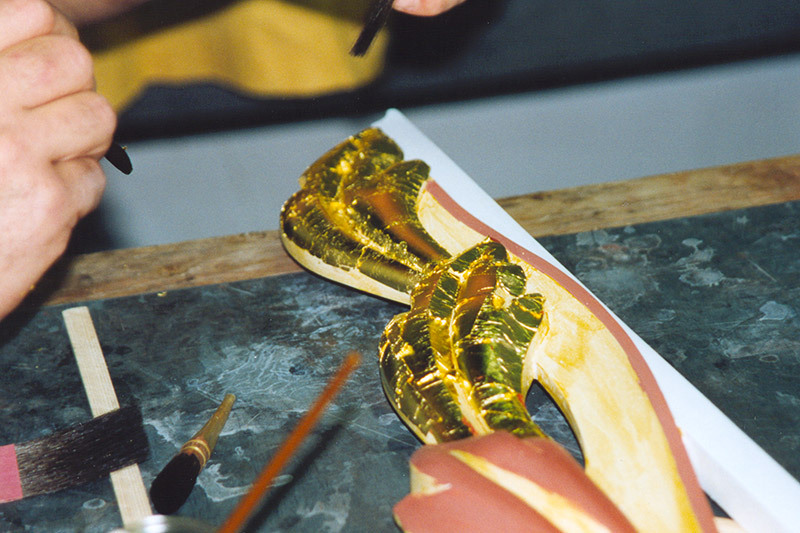 When confronted to complex and specific gilt alteration cases, like swellings or flakes, we call to the skills in gilt and painting restoration of the specialists of the Meyers workshop. 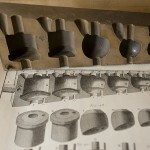 This technique is rarely found in old organs that favour solid wood, with the exception of rare ornamental inlaid threads on keyboard cheeks. 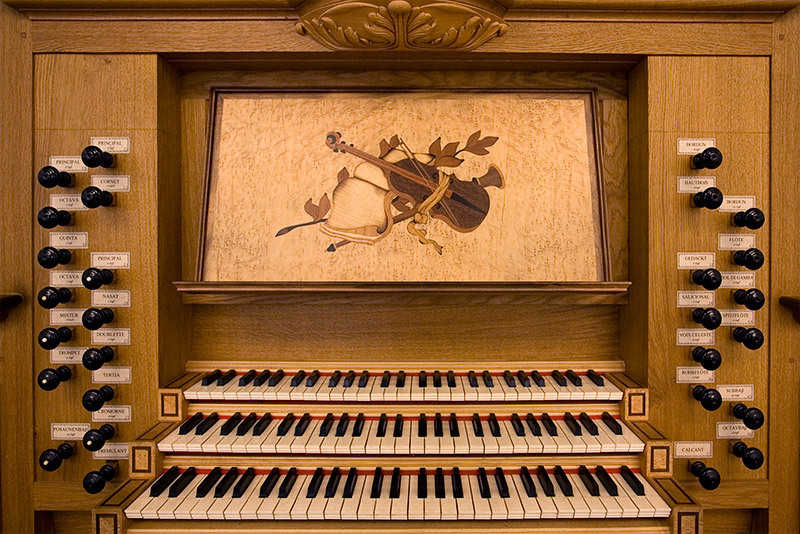 However, we are happy to adorn the music desk of new organs with a marquetry picture, which provides an additional source of delight for the interpreter. 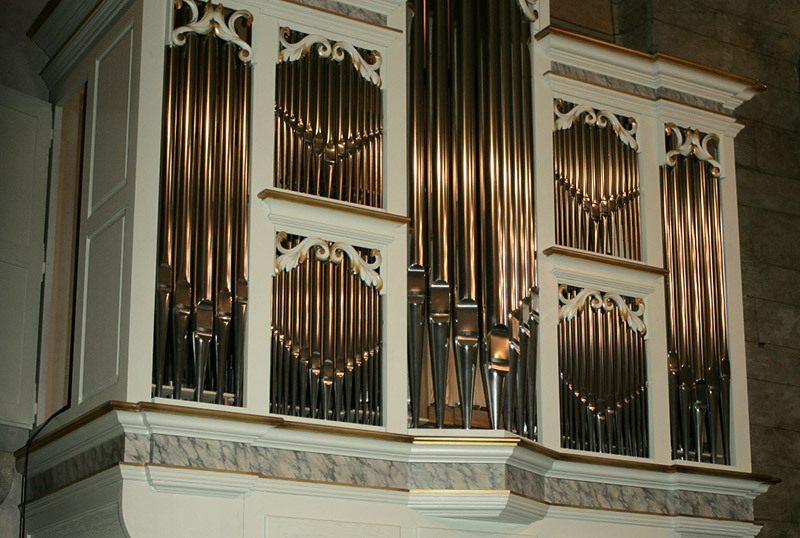 As for gilt, this kind of ornamentation is seldom seen on organs. 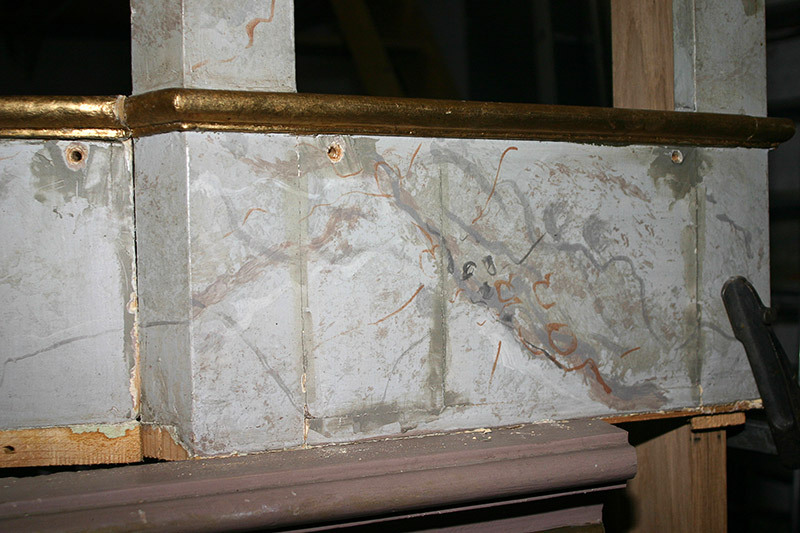 Nevertheless, we proposed a faux marble finish for the new organ in Luz-Saint-Sauveur and we have been led to restore an existing decor in Markt-Allhau. In both cases, we’ve chosen to partner with the Meyers workshop. As the essential control centre for the player, console design is subject of a very special care. 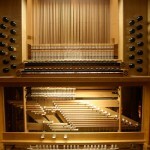 The adjustment of mechanisms is performed with extreme precision, in order to provide the organist a highly reactive instrument. In our new instruments, we exclusively provide tracker action. 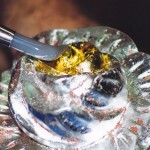 This traditional technique requires a clockwork precision but offers unmatched reliability and touch. Our organs can also be equipped on demand with electronic combinators: this task is outsourced to our partner Joël Pétrique from Dièse info. The wind supply could be compared with the lungs of the organ. 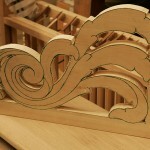 Bellows are supplied in wind by an electric blower. Our blowers are provided by Laukhuff or Konyves. We select them as quiet as possible, so as to prevent interference with the performer. 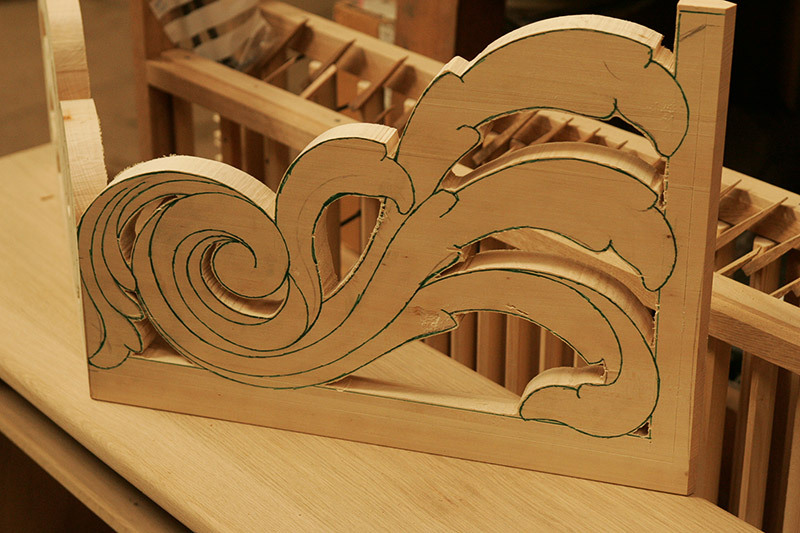 Our bellows are made in our premises by Mathieu Lichty: we favour wedge-bellows, because this shape enables a more lively wind. 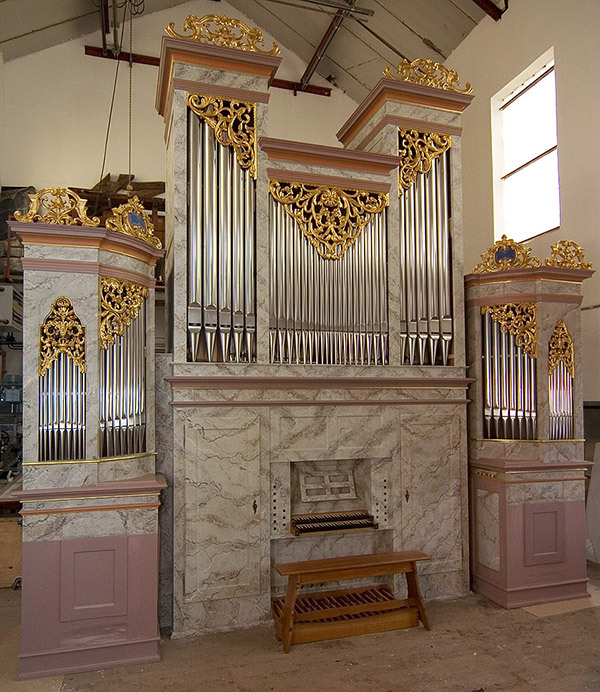 They are usually made of pine, except in the case of French classic organ restorations where the bellows are made of oak wood. We line our bellows with bovine leather that offers excellent durability. 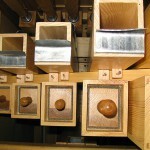 If wind supply were the lungs of organs, soundboards would be seen as their hearts. 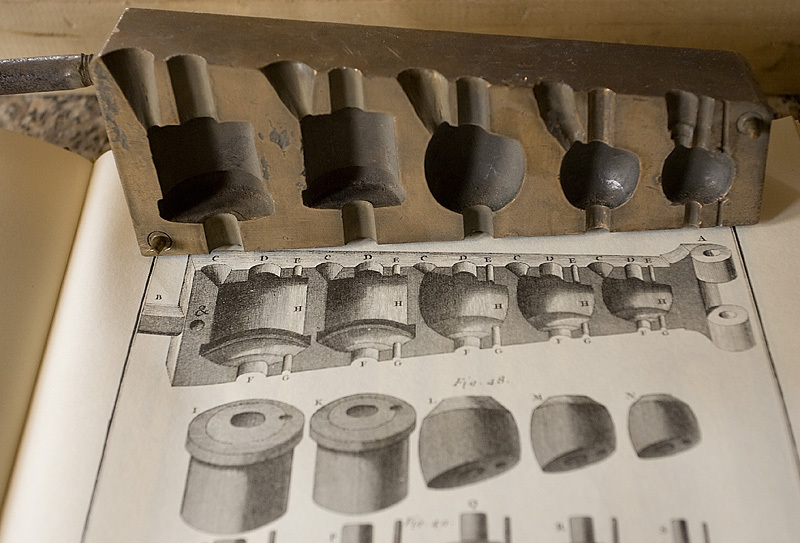 They are expected to store the pressured air which is produced by the bellows, in order to render it to the pipes, depending on actioned keys and shanks. 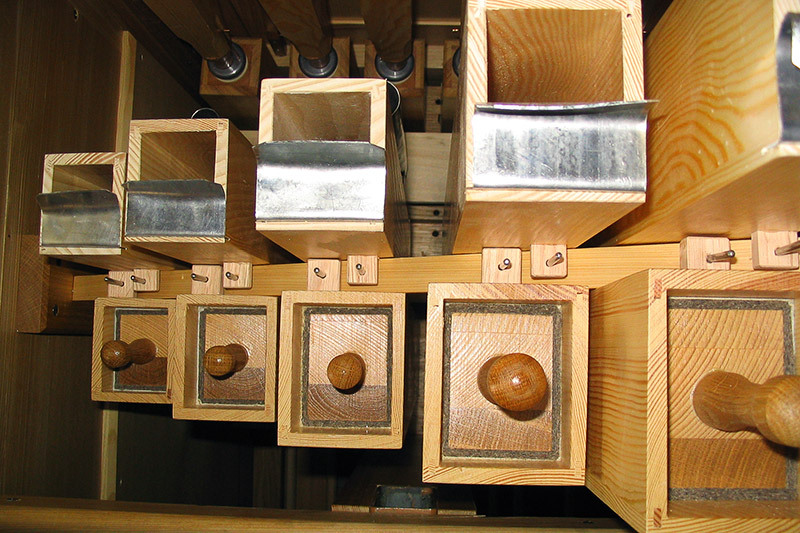 Soundboards must be perfectly airtight in order to seamlessly fulfil their duty. 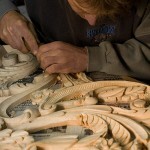 They are usually made by Jerome Maillet, who chooses the best oak wood for that purpose. 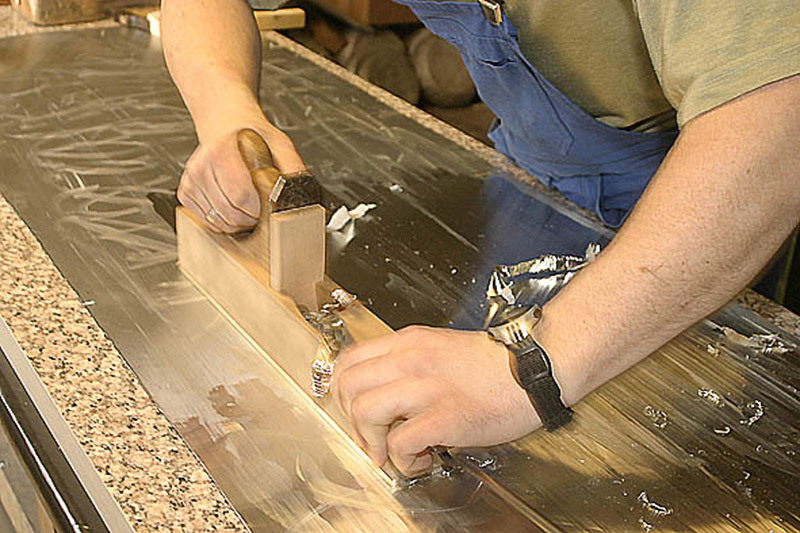 Supportive boards are made of engineered wood or in engineered oak wood for the most luxurious instruments. We opted for engineered wood because of its good resilience against changes in humidity. 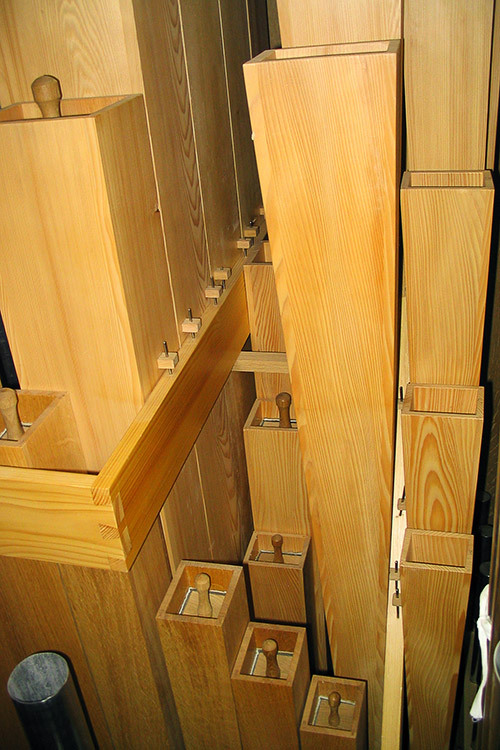 Indeed, being bonded to a non-sensitive framework, the engineered wood ensures a sustainable airtightness of soundboards, whereas cracks inevitably appear on solid wood boards, which lead in turn to generate runnings. 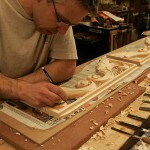 The wood pipes are made by Mathieu Lichty. 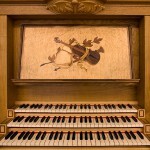 He chooses softwood for Germanic typed organs or oak wood for French classical ones. 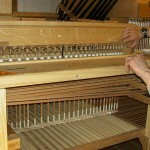 As for new organs, we usually build pedal pipes with softwood and manual ones with oak wood. 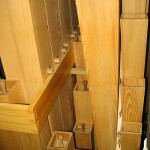 They are traditionally assembled by tongue-and-groove joints. 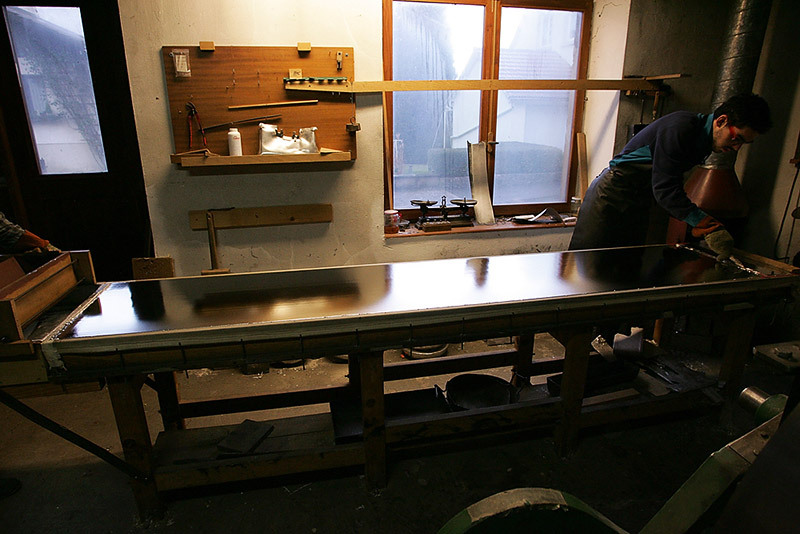 The tin and lead alloys used for metal pipes are casted and planed by hand in our workshop. Roland Weiss is our specialist in the manufacture of metal pipes. 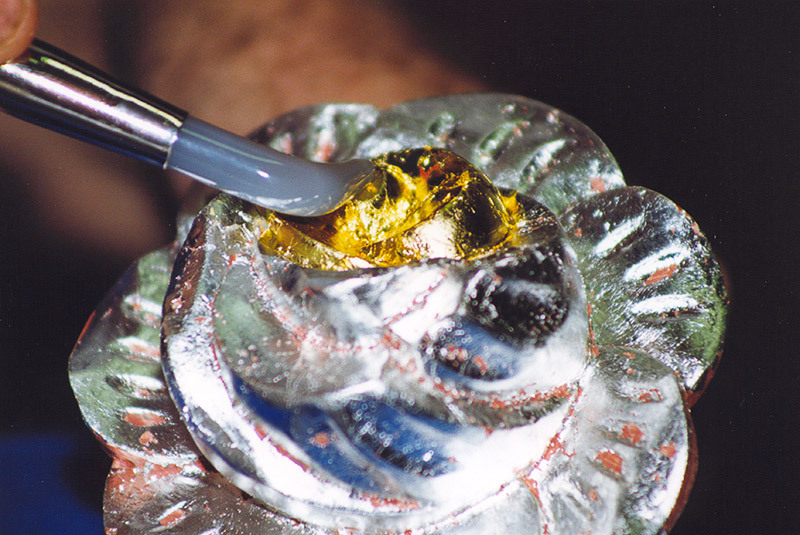 Open pipes are cut to length, whereas canistered pipes are soldered stopped. 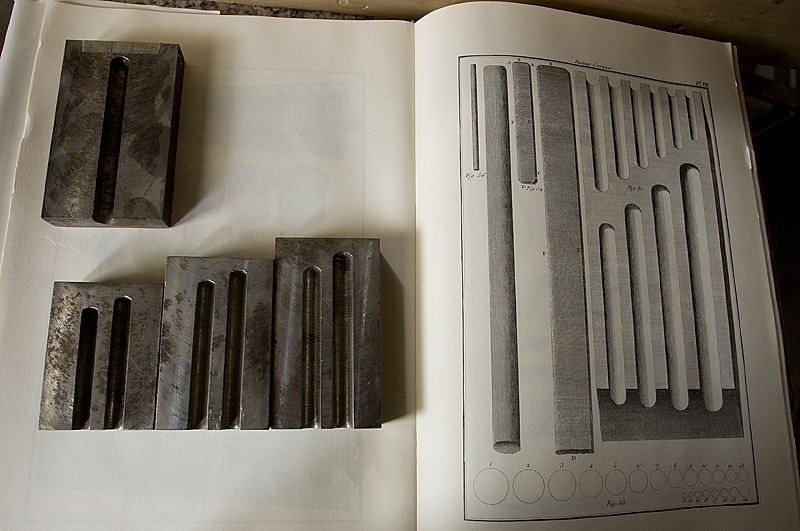 All reeds are forged by hand too. For new organs only, we can sometimes outsource a portion of this task to our partner Joël Klein, based in Woerth. 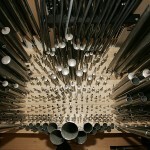 Voicing is the final milestone for the achievement of an organ. 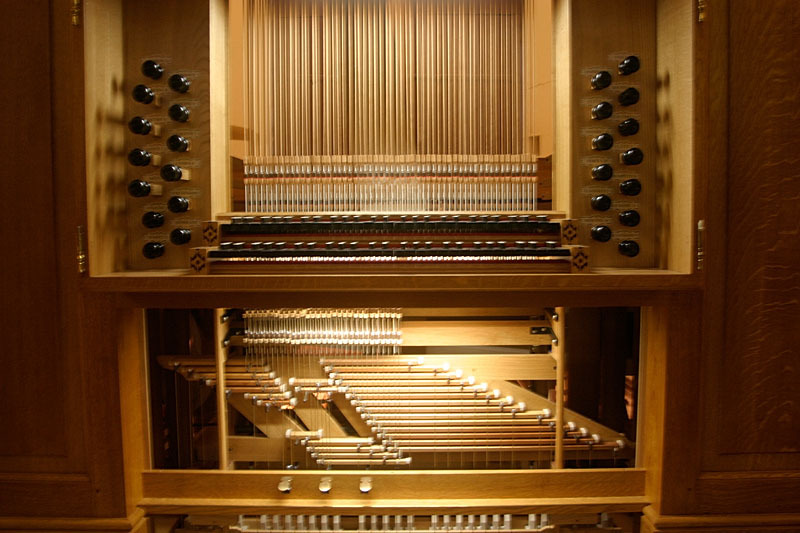 It has a number of factual steps, but voicing is much more than that: it is what gives to every organ its sound aesthetics and allows the master organ builder to fully express his sensitivity. 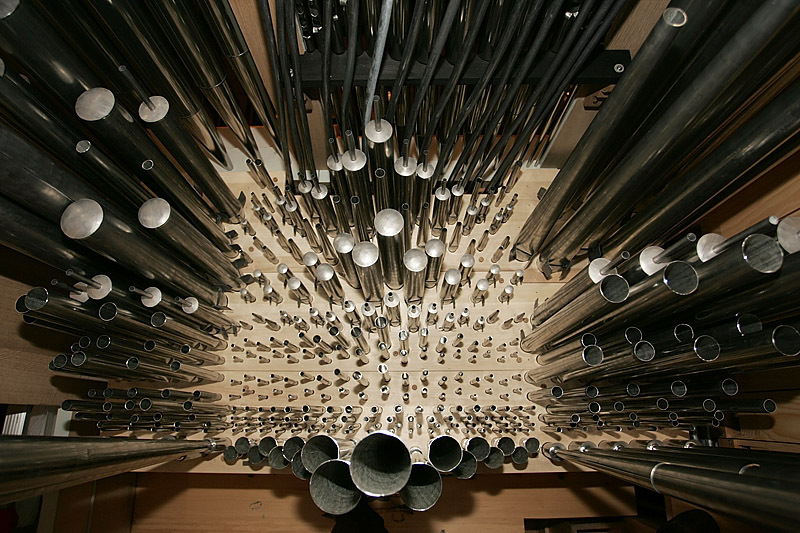 The main steps are to open the mouth of pipes, adjust the size of pipe toe holes, cut the pipes to length, regulate the relative loudness of pipes in each stop, in order to get clean and consistent sets, and finally adjust the loudness of stops between them, aiming at creating the most enjoyable sound blend. Voicing is achieved by Yves Koenig and Julien Marchal, in two stages. 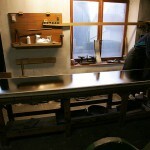 First, instruments are fully shop-voiced in our premises. 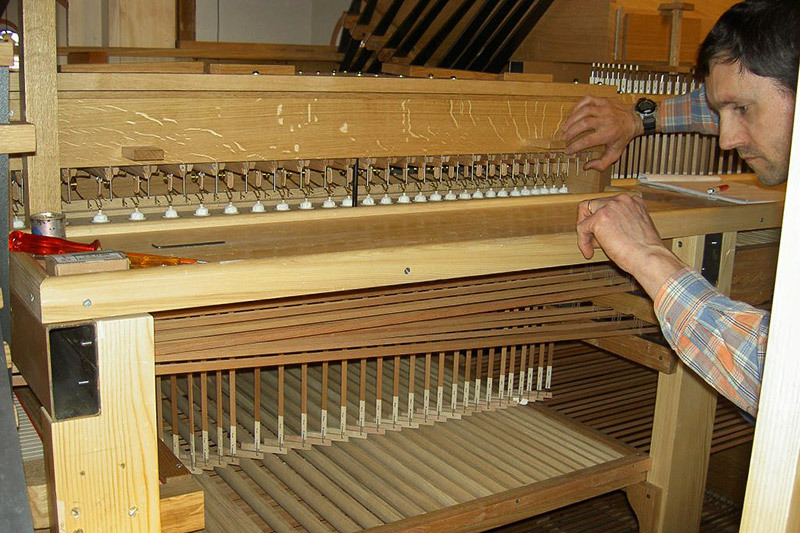 Then, a complete adjustment is performed, once the instrument is assembled in the intended building, in order to better adapt the loudness of sound.